What’s for dinner? Not a complicated question, right? Several decades ago the answer was whatever we had harvested from our own garden. Some of us grew up on farms and we ate what we raised. What was in season or what mom had pre- served were daily deciding factors. But it’s a new world and today we go to grocery stores and are confronted with thousands of seductively packaged products placed to attract our attention and challenge our grocery budget. Americans pay less for food than any other industrialized nation on earth, but at what cost to us and to those striving to provide us with these food options? Is our food fresh? Was this food grown locally or shipped from Chile? And if shipped from Chile, what did the transport cost? If it’s organic, how much more did we pay? What are GMO and “Seed Control”? 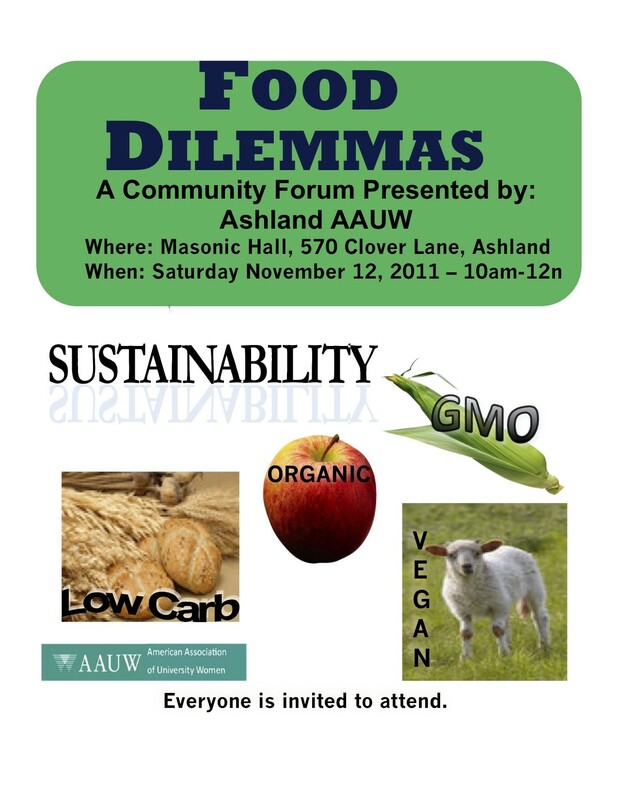 Our three speakers will provide some answers: Chris Bourne, a local farmer and permaculture designer; Tracy Harding with the Rogue Valley Farm To School program; and Sharon John- son, Associate Professor with OSU Extension and Health Educator for the Mail Tribune. Please join us for this event about food. Not many subjects are more important than this! I am the co-chair of the Ashland AAUW's Spring Garden Tour which is our largest fundraising event of the year. The funds we raise annually allow us to give scholarships to women attending SOU and RCC. Last year we gave out $12,000 and we hope to exceed that amount in 2012.